The Seal Bay Discovery is an incredible touring experience offering you an amazing opportunity to walk among Australian sea lions in their natural habitat. This is a perfect tour for nature lovers as it also includes the Birds of Prey In-Flight Display, Kangaroo Island Wildlife Park and a visit to Emu Ridge Eucalyptus Distillery. An early morning pick up from your hotel for a scenic coach journey to Cape Jervis taking in the picturesque Fleurieu Peninsula with its vineyards, coastal views and rolling hills. On arrival, board the SeaLink ferry for the 45 minute crossing to Penneshaw on Kangaroo Island. Here you will board your luxury SeaLink coach and your local driver/guide will take you on a tour of South Australia’s premier nature-based tourism destination. Your first official stop will be Emu Ridge Eucalyptus Distillery where you will listen to an introductive talk about the history of the oil distillery and take a guided tour. Finish off with some free time in their souvenir shop where you will find an assortment of Eucalyptus products. Continue onto Vivonne Bay Bistro located on a 260 hectare bush property, for a delicious two course lunch. 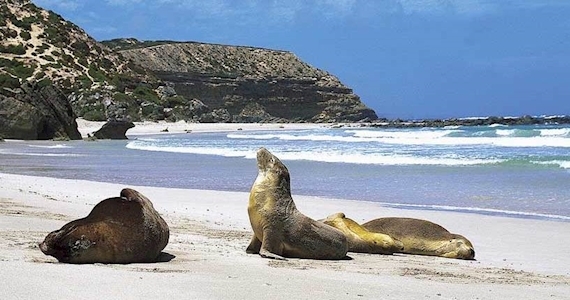 After lunch visit Seal Bay Conservation Park and enjoy a guided beach walk with a National Park Ranger amongst a breeding colony of wild and rare Australian sea lions. Your tour will then visit another amazing wildlife attraction, the fascinating In-flight Birds of Prey Display. Enjoy a delightful interactive experience and meet an array of birds and raptors. From here you will travel to Kangaroo Island Wildlife Park where you can get up close with Koalas, see Penguins swim and play, hand feed Kangaroos and Wallabies, learn about endangered species, interact with Snakes, Crocodiles and reptiles and experience Kangaroo Island Wildlife at your fingertips! Return to Penneshaw Ferry Terminal for the return journey to Adelaide.